Herzogenaurach, Germany, November 14th 2018 – adidas today announces the global launch of ALPHAEDGE 4D, engineered with the ADIDAS 4D midsole, for controlled energy return and breathable cushioning during intensive training runs. For exact, controlled energy return - the intricate lattice structure and responsive cushioning absorbs pressure from any angle and returns energy, propelling the foot forward and supporting movement where needed. 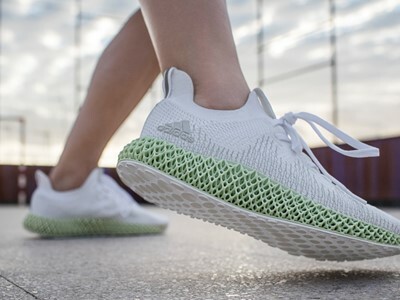 The ADIDAS 4D midsole is printed with light and oxygen, using Digital Light Synthesis™, a technology pioneered by Carbon (partnership first announced in April 2017). Carbonʼs proprietary Digital Light Synthesis™,is a breakthrough technology that uses digital light projection, oxygen-permeable optics and programmable liquid resins to print highperformance, durable polymeric products. A super-lightweight upper that encases your foot in a seamless sock-like fit - providing the support and comfort needed during sharp lateral movements and tight turns. Each thread is individually constructed millimeter by millimeter with FORGEFIBER - a process using TPU coated yarn, that maximizes performance when stitched at various angles and layers for ultimate strength in motion. ALPHAEDGE 4D FW18 launches globally across adidas.com, the adidas app and select retailers from November 17th 2018 - RRP $300. For more information visit adidas.com.